In a few days one of the most historic games in NHL and hockey history hits its birthday again on New Year’s Eve. On December 31st we relive the historic Soviet Red Army vs Montreal Canadiens match up that ended 3-3 and has been called one the greatest game ever played. Watching it on the CBC who usually rebroadcast the game every year and on YouTube you learn that the Soviets (Red Army and the Soviet Wings) were on their first ever tour to play a few of the NHL teams over the holidays with the series being called Super Series ’76. The Red Army before coming to Montreal had just beaten the New York Rangers 7-3 in their first game and the Soviets came to Montreal with the legendary in net for them who would put on a show for the fans at the Forum. Also the Soviets were led by the late Valeri Kharlamov who was already known to Canadian fans from the Summit Series in 1972 but was knocked out of with a vicious two hand chop across the left ankle from Bobby Clarke which broke his ankle. Scotty Bowman’s Habs went into the game with one of the hottest goaltenders in the NHL in the form of Ken Dryden who was in his 5th season and already had a Calder, Conn Smythe and two All Star game appearances to his resume. The Habs, for offensive fire power had Guy Lafleur who was on his way to a 56 goal season in 75-76, Pete Mahovlich, Yvon Lambert, Yvan Cournoyer and a solid D core lead by Larry Robinson and Serge Savard. USSR having played two Summit Series in the decade already with Canada winning the 1972 edition in 8 games and the Soviets steam rolling Canada (with almost the entire roster being WHA players) winning the series 4-1-3. Even the commentary has a feel of Canadian bias if you watch it on YouTube you see on CBC, Howie Meeker not just calling a Habs win but saying to the camera “sit back and relax folks the Canadiens are going to win tonight!” just not giving the Red Army a chance at all to beat Montreal. The rivalry was even around the media. Watching the series you get a sense of the fact that out of all the teams that the Habs had played the Soviets are a club that the fans wanted them to beat the most, feelings towards them were not the best. Even though the Habs jumped out to an early lead thanks to a Pete Mahovlich goal early on the Red Army hung around with the Bleu Blanc et Rouge thanks to their long passes to match up with Montreal’s tight defense and their ability to make magic happen with the puck on the fly. 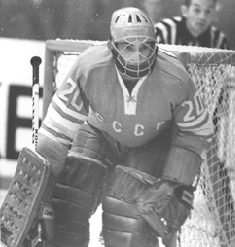 Tretiak was able to keep the Soviets in the game all night long facing way more shots than Dryden in the Montreal net as the shots ended up 38-13 In favor of the Canadiens. With each Soviet goal, you can sense a stunned hush come over the fans at the Montreal Forum showing that they truly did not expect it to be even close to a competitive game. Even with the final buzzer ending in a tie the crowd at the Forum still gave the clubs a standing ovation as they were witness to one of the greatest games played in pro hockey. To watch the game 35 years after the tension has ended and the dissolving of the Soviet Union the game is still a great history lesson for many young hockey fans to show how Russian hockey was still somewhat of a mystery to North American hockey fans. Hopefully this New Year’s Eve you’ll tune into the broadcast of the game or before then look for the game footage online to have a look at a game that still impacts the hockey world to this day.